Agusta's newest helicopter, the widebody A-119 Koala is a relatively large single turbine powered helicopter designed for a range of utility transport missions where it makes economic sense to operate a single when the redundancy of a twin is not required. 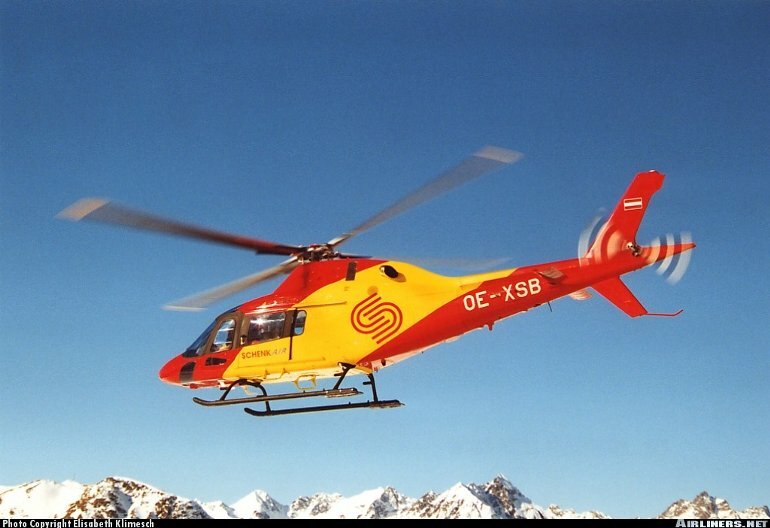 Agusta began development work on the Koala in 1994, leading to the first prototype's maiden flight in early 1995. A second prototype flew later in that same year. Agusta originally aimed to gain certification for the A-119 in late 1996 but this was delayed until late 1998. One cause for the delay has been strong sales demand for the A-109E Power, another to enhance the A-119's performance in response to customer feedback. Production deliveries are planned for 1999. The Koala's big selling feature is its large 'widebody' fuselage. Agusta says the cabin is 30% larger than the cabins of any other current production single engine helicopter. A measure of the cabin size is that it can accommodate two stretcher patients in an EMS role, along with two medical attendants. Most other single engine helicopters typically are only equipped for a single stretcher because of a lack of space (Agusta sees medical retrieval operators as prime potential Koala customers). Access to the main cabin is via two large sliding doors, one either side of the fuselage. A baggage compartment in the rear of the fuselage is also accessible in flight. The first prototype Koala was powered by a Turboméca Arriel 1 turboshaft but it was subsequently reengined with a 747kW (1002shp) takeoff rated Pratt & Whitney Canada PT6B-37, which powered the second prototype and will feature in production aircraft. Another design feature is the Koala's composite four blade main rotor which features a titanium fully articulated maintenance free hub with elastomeric bearings and composite grips. 1st prototype - One 595kW (800shp) Turboméca Arriel 1 turboshaft driving a four blade main rotor and two blade tail rotor. Production aircraft - One 747kW (1002shp) takeoff rated Pratt & Whitney Canada PT6B-37 turboshaft. Max cruising speed 260km/h (140kt). Service ceiling 17,915ft. Hovering ceiling in ground effect 10,890ft, out of ground effect 8040ft. Max range 653km (352nm). Endurance 3hr 45min. Max takeoff with an internal load 2600kg (5732lb), max takeoff with a sling load 2850kg (6283lb). Main rotor diameter 11.00m (36ft 1in), length overall rotors turning 13.10m (43ft 0in), fuselage length 11.07m (36ft 4in). Main rotor disc area 95.0m2 (1022.9sq ft). One pilot and passenger on flightdeck. Main cabin seats six in standard configuration. In an EMS configuration can accommodate two stretcher patients. Entered production in 1999. Planned annual production rate of 20 to 25 aircraft per year. 60 sold at time of writing. Basic aircraft unit cost approx $US1.7m. Second assemly line to be established at Denel in South Africa.